"You will find our chat and date safety tips apply to any kind of dating site, but not to all chat sites. Please do not confuse our chat and dating safety advice with ANY web based/test chat service. Unlike the vast majority of web based chat sites that strongly discourage meeting other chatters, Phone and Flirt chat line has thousands of members who do choose to chat and later meet in person. One reason for this is that Phone and Flirt does require age verification and, similar to all other personals sites, maintains a private database with contact information about members. As a rule, you should never give out private information nor agree to meet anyone on a web chat/text chat service unless otherwise advised by THAT web site. Phone And Flirt chat line is a unique, fun and exciting opportunity to chat, flirt and meet other singles." "At Phone and Flirt you can express your desires, interests and personality ... and connect with those who share those interests. However, remember that using common sense will make our chat line, or any dating service, a safer and more pleasurable experience." Protect your privacy. Always. The whole idea of our flirt and dating chat line is that you can be anonymous until, if and when, you are completely ready to meet someone. In fact, you are under no obligation to meet anyone in person. With our chat technology, NONE of your personal information is ever available to other callers. Other callers will never know who you are unless you provide that information. Never include your last name, email address, home address, phone number, place of work or any other identifying information in your personal greetings or messages. Stop communicating with anyone who pressures you for personal information (or attempts in any way to trick you into giving it). There are thousands of men and women to meet. Don't waste time with some pushy chatter. Take your time getting to know other chatters Talk, chat, flirt, make new friends. Although our chat line is structured for phone chat and dating, you never have to meet with anyone for a date. Many members prefer just to chat. If you are interested in dating (as many of our members are) there is no reason to rush. There are thousands of men and women to meet. If by chance someone behaves oddly or inconsistently, just stop talking with them. Move on. Keep in mind that almost everyone likes to portray themselves in the best possible way ... However, a few people go to far with this and just out right lie. If someone just seems 'wrong', trust your feelings and go chat with someone else. Do not waste time with men or women you just don't like. You are very likely to make a great connection with many other people at Phone And Flirt chat line. Only agree to a date when YOU feel good about meeting someone. Even if you decide to arrange a meeting, you always have the right to change your mind. If you decide that is best for you to remain anonymous, that's great. Trust yourself. As with any dating service, Phone And Flirt chat line cannot decide for you when or if to meet someone. That is totally your responsibility. As such, you have every right to decide when, or if, you should date anyone. Doing some background checking is a good idea. Because privacy and being anonymous is what Phone And Flirt chat line is all about, we do not invade anyone's privacy by doing background checks. However, there is no reason that YOU cannot check someone's background. Especially if you decide to meet them in person. If fact, we would encourage members to do their own research prior to dating. And, that should apply to any dating service. If you mutually agree to meet, you should begin by exchanging some personal information. Then, utilizing Internet search engines, do some background checking. Use your head as well as your heart. If you want to get real serious about doing a background check, try Dating Safety Check or Instant Background Checks. For a little bit of money, you can get a lot of information on as many dating partners as you want. NOTE: If you encounter someone underage using our services, be responsible and alert our customer service team. People should earn your trust. Sadly, not everyone tells the truth. Take all the time you need to test someone's trustworthiness. If you suspect someone is continually being deceptive, they likely are. If you mutually decide to take your relationship to the next level, be smart and take the time to be sure this person is worth spending intimate time with. If you see any warning signs, slow down or stop. Do not ignore displays of unnecessary anger, intense frustration or attempts to manipulate you. Someone acting in an aggressive manner, making demeaning or disrespectful comments or any kind of inappropriate behavior are all warning signs. You should be concerned if your date ever behaves in an unacceptable manner, especially without providing an acceptable explanation. This includes lying about age, marital status, profession or employment, family background or wanting to know too much about your finances. If someone wants to keep some things private, fine. If someone constantly fails to provide honest answers to direct questions (or becomes overly deceptive), that is a big warning sign. Do not ignore it. Move on. There are thousands of other great men and women to meet. Always meet in a safe place. If you decide to meet someone, always tell a friend where you are going and when you will return. Leave your date's name and telephone number with your friend. Never arrange for your date to pick you up at home. Provide your own transportation. Busy, public place make excellent meeting locations such as a coffee houses, restaurants, art galleries, public parks or large gatherings such as a concert. A good tip is arrange a double date. Invite other friends to join you for a first date. Needless to say, but, also refrain from drinking excessively. This will impair your ability to make good choices, not to mention making a poor impression. If you and your date decide to move to another location, take your own car. Consider making a phone call to inform someone (or leave a message on your own phone) that you are going with your date to a new location. It is not rude to allow your date to see you make that call. When traveling to another city or town to meet someone make sure you have your own car and/or hotel room. DO NOT disclose the name of your hotel and never allow your date to make the arrangements for you. 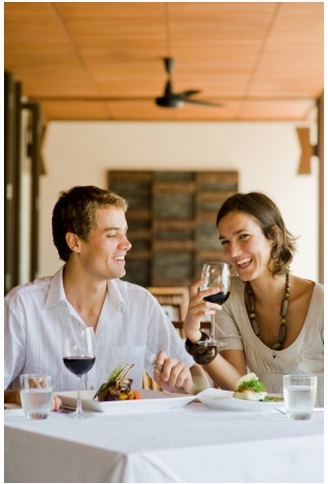 Call your date from the hotel or meet at a public location you agree upon. If the location seems inappropriate or unsafe, trust your instincts and change the location. Always make sure a good friend or a family member knows your plans and has your contact information. And if possible, carry a mobile phone at all times. Traveling to meet someone in another city is an exciting adventure. Keep it a fun, memorable adventure by being smart about safety. If you feel uncomfortable or unsafe at any time then leave. Dating and meeting new people is all about having fun. If a situation, place or person makes you uncomfortable or unsure, that is not fun. Never do anything that makes you feel unsure or unsafe. Use your best judgment to diffuse the situation and get out of there. Maybe tell your date you are feeling poorly and you need to end the date, now. Excuse yourself to call a friend for advice; ask someone else for help; call a cab or just say you are done for the night and leave. Never worry or feel embarrassed about your choice to be safe or to get away from a date that is just not what you wanted. If it turns out you over reacted, so what? Apologize and move on. Your safety is always more important than anyone's opinion of you. Again, dating and meeting people is about adventure, romance and having a good time, if that changes, the date is over, go home. Have as much fun and meet as many people as you want. Dating and flirting is all about connecting, having fun and enjoying yourself. We wish you a fun, exciting, dating and chatting experience.